North Korean leader Kim Jong Un (C) visits the Kumsusan Palace of the Sun to pay tribute to President Kim Il Sung and leader Kim Jong Il, on the birth anniversary of Kim Il Sung on (known in North Korea as 'The Day of the Sun') in Pyongyang, North Korea, 15 April 2018 (issued 16 April 2018). Photo by KCNA. North Korea celebrated the anniversary of regime founder Kim Il Sung's birth without provocative displays or the mention of nuclear weapons during key memorial events, amid the peace-building atmosphere between the two Koreas. In stark contrast to the Apr. 15 ceremony held last year, when a military parade showcased intercontinental and submarine-launched ballistic missiles, the state-run media seemed to rather emphasize Pyongyang's friendship with Beijing, TV Chosun reported. With the visit of a Chinese cultural delegation led by China's Communist Party's International Department head Song Tao, state broadcaster Korean Central Television shows North Korean leader Kim Jong Un hugging Song three times upon their meeting at the ruling Workers' Party building. The venue is decorated elaborately, with a banner reading "North Korea-China Friendship." Kim and Song reportedly discussed "important matters of mutual concern," which observers believe pertain to the North's upcoming summits with South Korea and the United States on denuclearization. Pyongyang and Beijing have been aiming to strengthen their decades-long ties ahead of the back-to-back summits. Kim's wife Ri Sol-ju was shown attending the Chinese arts delegation's ballet performance along with the North's key regime officials. Other media coverage on the Apr. 15 event included a firework display for Pyongyang locals. 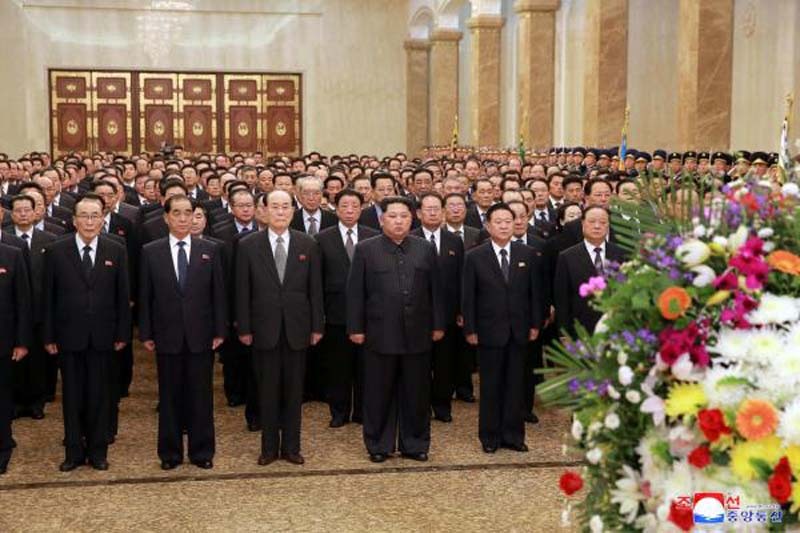 Pyongyang media also reported Monday that leader Kim Jong Un had paid his respects his grandfather and his father Kim Jong Il by paying his respects at the Kumsusan Palace of the Sun where their embalmed bodies lie. Accompanied by top regime officials including parliamentary chief Kim Yong-nam and ruling party vice chairman Choe Ryong-hae, the young leader laid flowers in front of their portraits.